JOIN US FOR AGE 3.0 2017! Here is what we were up to last year. What is Age 3.0 – Aging in the city? Age 3.0 is an interactive and participatory trade fair that will take place on November 1st, 2017, from 9AM to 5 PM in the atrium of the EV Building of Concordia University, 1515 Ste-Catherine Street West, at the corner of Guy, in downtown Montreal, Quebec. It surrounds the second Creative Aging Festival, which engages the citizens, businesses, and organizations of Quebec in a conversation about the realities of aging. It is a part of a promising movement towards a collective understanding and “sustainable aging”. The Canadian population, currently at 35.5 million, is expected to reach 42.5 million in 2056. Seniors are expected to make up 25.7% of that population–compared to the 21% projected worldwide–or nearly 11 million Canadians. Communautique, the ACT Project (Aging + Communication + Technologies), Concordia University, and engAGE are playing their part with this interactive and participatory event in order to contribute to this important movement toward sustainable and creative aging. Who can visit the fair ? Everyone is welcome! Seniors and their families, companies and startups, inventors, engineers, makers, practitioners, designers, usability specialists, artists, architects, corportations, and anyone who has the expertise or the desire to learn and share new modes of aging sustainably. Please register in advance here. Note: registration will also be available on site. What’s on the agenda ? The public will be able to see and experience the innovations that are happening right now inside research centres and companies. Visotors will be invited to experience, evaluate, and provide feedback on products and services that will be presented at the kiosks. What is the Silver Economy ? In Quebec, the Silver Economy is just beginning, and by organizing the creative aging fair Age 3.0, Concordia, Communautique, and the ACT project hope to arouse interest in the public about the needs and challenges that this new social and economic demographic face. engAGE aspires to change how we think about aging. Through innovative, collaborative, interdisciplinary research, engAGE researchers work with older people and their communities in order to address challenges and facilitate opportunities in all realms of life: social, physical, cognitive, emotional, and political. 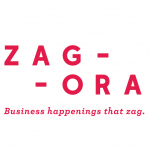 Zagora is a firm specializing in the production of conferences and business events. She strategically advises organizations that want to: make their events more relevant, crowded and profitable.